The Metris is expected to help Mercedes increase van sales in the U.S.
Ford Motor Co.'s segment-leading Transit Connect small cargo van may get its toughest challenge yet from an unlikely competitor in the U.S.: Mercedes-Benz. At a work-truck show last week in Indianapolis, Mercedes-Benz Vans USA, the commercial arm of the German automaker, introduced the Metris, a tall, midsize Euro cargo van that will have a starting price of $29,945. Passenger versions will be priced from $33,495. Both prices include shipping. The Transit Connect established the small-van segment in the United States in 2009, and is priced, including shipping, from $23,325 to more than $36,000 fully loaded. Last year, Ford sold 43,210 Transit Connects, up 8.8 percent over 2013. The small-van segment is growing fast, with new entries from Nissan, Chevrolet and Ram. The Metris will be the largest of the small Euro vans, with a wheelbase an average of 13 inches longer than that of the Transit Connect. Mercedes says the additional length will help Metris haul 880 more pounds of cargo than the Transit Connect. The Metris, due to arrive at Mercedes dealers in October, will be powered by a 208-hp gasoline engine mated to a seven-speed automatic transmission. The van will be available with a long list of safety features. Cargo versions will have six airbags, while passenger versions will have eight. 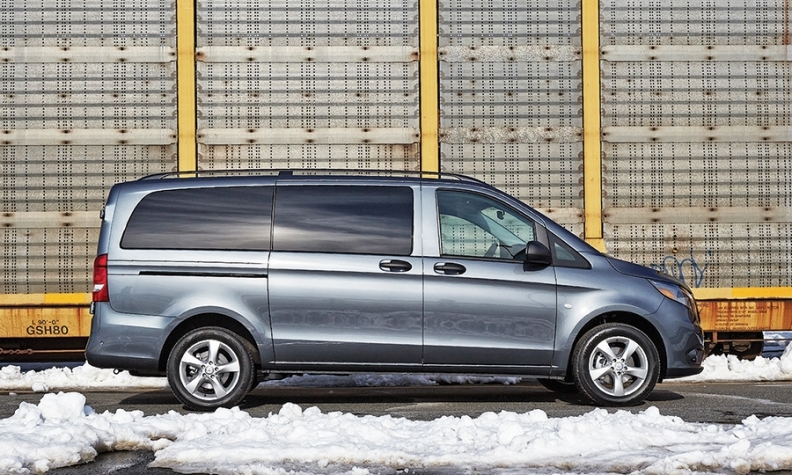 The Metris, sold globally as the Vito, has been a mainstay in Mercedes' lineup since 1996. Slotted under the Sprinter van, it is expected to help Mercedes increase its U.S. van volume to about 50,000 per year. To avoid the 25 percent tariff known as the "chicken tax," the cargo versions of the Metris will be stripped of their powertrains, fuel tanks and batteries and shipped to the Daimler Vans plant in Ladson, S.C., for reassembly. Passenger versions are not subject to the tax.